For use with misting fountains, oil warmers and more. This high quality eucalyptus fragrance oil is the perfect way to add scent to any room. It offers a more natural way to deodorize your home without having to turn to dangerous cans of chemical sprays. The aroma is strong enough to fill the room with a pleasant scent, but not too overpowering. Only a small amount is needed to reap the benefits as a little bit will go a long way. Always start with a small amount, and then add more if it becomes necessary. If you are using it in a misting fountain, you will only need a few drops, added straight to the bowl. Add the oil carefully, and put it right in the water. Once the fountain is running, the mister will diffuse the fragrance all over the room. It works very efficiently, so you only need a small amount of oil for each bowl of clean water. Be careful not to add too much, because overuse will cause residues to build over time, and that will reduce the life of your mister. If used in the correct amounts, it can add an additional pleasing effect without any risk of harm. Eucalyptus is said to have deodorizing and antiseptic qualities. For this reason, it is a great scent to take the stink out of any room, and it will refresh the air as it cleans it. Eucalyptus is a common ingredient in cough drops and decongestants because it can improve breathing and open up airways. As it diffuses into the air in your home, the fresh and pleasant scent will help clear your lungs and relieve congestion brought on by colds and allergies. This particular oil should never be ingested, but adding it to a mist fountain or oil warmer can be quite beneficial. In a matter of minutes, the whole room will be filled with a safe and natural fragrance. It will reduce the yucky smells and replace them with something pure and clean smelling. If you already have a misting fountain, then adding some oil to the water will offer a whole new experience. This product is also good for any type of oil warmer or fragrance diffuser, and it can be used right on clothing, skin or other surfaces, but is not meant to be ingested. Add a pleasing scent to the air in your home without the use of aerosol sprays or harsh chemicals. This eucalyptus fragrance oil will help you deodorize your home with a safer, more natural method. Order Yours Today. 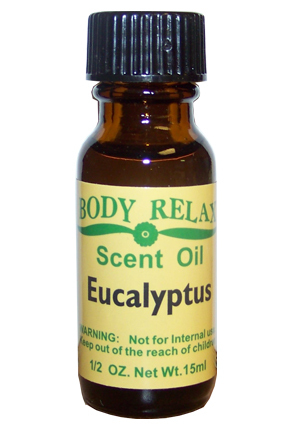 Eucalyptus Fragrance Oil - Add aroma to your home the safe and natural way. Use this quality fragrance oil to add a pleasing scent to the air in your home. Order Yours Today! smells good, lasts long and the price is great. great deal.. This oil is great. It smells wonderful and it's scent lingers throughout the house. Can this be used in the water for my Rainbow Mate? The Mate is a product made by the Rainbow vacuum company which is used to purify the air. Yes it can. Start with 2-3 drops. Can this product be used in a fragrance warmer with a unscented tea ight? Of course! It's perfect for that.